Rock biographies… the ultimate beach read. The holiday week has me in a beach state of mind, especially as the weather has recently turned from cool and rainy to hot and bake-y. But the tepid weather helped me catch up on my magazines, and I finally read the recent Jimmy Page interview in Rolling Stone. The interviewer references some of the “legend” surrounding the band. Page refused to get sucked in, saying that if it weren’t for their music, no one would be interested the debris of their personal lives. But, would they? 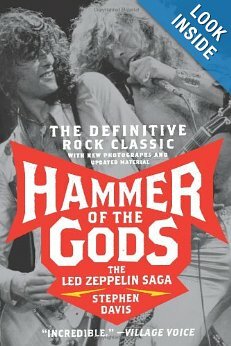 I think Hammer of the Gods is a wild ride of a book, even if you don’t know much about Led Zepplin’s music . In fact, I loaned it a couple of years ago to a book club friend of mine who read it simply for the juicy bits. Granted, the band’s fame, fueled by their talent, changes the context of their crazy antics. But, there’s still conflict, characters (in some cases ones in whom we already have an emotional investment), plot and story arc — all the makings of a good tale, and considering the content, an excellent beach read. 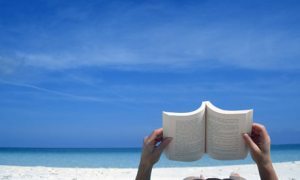 If you’re unfamiliar with what makes a book a beach read, specifically, think about what you’d like to read in the midst of blue skies, white sands and whispy, lofty clouds. You want something not too deep, not too depressing, easy to read and maybe even a bit trashy. Romances are often cited as classic beach books. Rock biographies can fit the description too. Not every rock biography is suited for the sand-in-your-toes reading occasion, though. Dream Brother is a deep and satisfying story about the short life of Jeff Buckley, but it is more suited to gray skies and crashing surf viewed from the dry side of a rain speckled window. Reading about the Doors and Hendrix is too dark, in my opinion, as their stories are closely tied to premature death. So, if you want an easy read that packs in drama, exotic locales, flamboyant personalities and the jet-set lifestyle that doesn’t destroy you beach vibe, here are some recommendations. Hammer of the Gods. Brace yourself from some gratuitous, deviant and reckless behavior in this tell-all by rock journalist Steven Davis, who takes a lot of what is included from Richard Cole, Zepplin’s tour manager. The band’s and its inner circle’s shameless behavior endears them to few, but reading about their antics is pure guilty pleasure. It is a glimpse of what happens when decadence is afforded to young men who aren’t quite ready to handle the Pandora’s box of fame. The True Adventures of the Rolling Stones. I’ve read Keith Richards’ autobiography and other books about the Stones. Richards’ maintains an element of lightness even as he describes his multiple cold-turkey episodes, but his account of the band’s career also includes a very long passage about an early love of the blues, which exists in much the same form in every biography of a sixties British Invasion musician. This is way too boring for the beach. 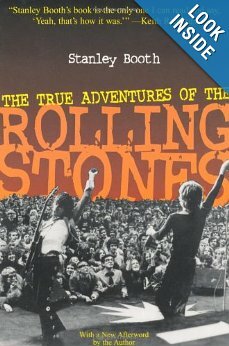 Stanley Booth, on the other hand, spins a tale of life in the late-60s and early-70s hanging with the band at the creative height of their careers. You get the escapades, drugs, parties, wives and girlfriends along with the music. Booth writes in a way that makes you feel you were riding shotgun the whole time. It remains a classic among rock biographies, even today. I’m With The Band. The trend here is that rock biographies covering the 70s provide the best beach reads, and this one by one of music’s most famous groupies is no exception. Pamela Des Barres delivers on all levels when it comes to the details you want most from someone with her unique perspective into the rock-n-roll lifestyle. Many rock biographies give a nod to the role of the groupie back in the industry’s heyday, but Des Barres gives you the real inside scoop in a voice that is as unapologetic as it is authentic. It’s hard to put this one down without liking her at least a little bit. In the Pleasure Groove. How often do you see a man on the beach reading a book (or a Kindle)? 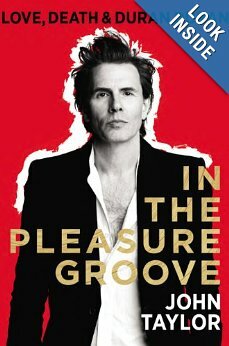 Beach reads are almost always in the hands of women, so it makes sense to include this autobiography of John Taylor from Duran Duran. But, it’s not its appeal to the ladies that makes it fitting for sun and sand. (It did, after all, receive a very favorable review in the New York Times.) This book more than any other I have read gives an honest account of how fame and the lifestyle of a rock star can make what should be the highlight of one’s life a tortuous struggle. Many musicians have written about their addictions, but few have been able to tap into their vulnerability for readers in the way that JT does. Fans of our hero should get ready to swoon all over again. Feel free to share your suggestions, as there is plenty of summer left to indulge!